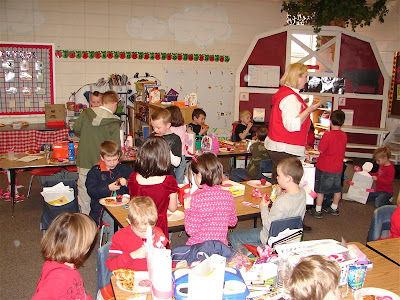 Our first party yesterday was at Rebekah's school. 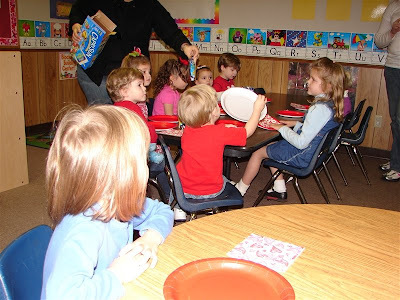 She attends on Mondays and Wednesdays, but they had their party on Thursday. She and one other girl, MaKenna were the only two from her class at the party. 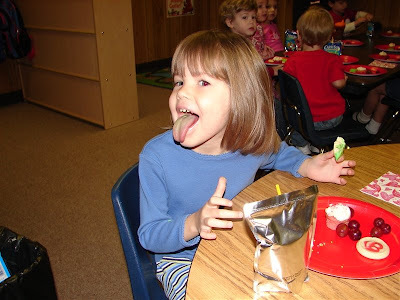 Since all the other kids were strangers to her, Rebekah didn't want to sit at the table with everyone. The only way I could get her to sit down was at the round table with me. The other kids are a younger group of kids too. A plate FULL of yummy and sugary things! She liked the cookie with the green frosting best. And here she is showing off her green tongue! She received a bag full of nice valentines and sweet candy. Later that morning was Rachel's party. She got out of school at noon yesterday since they were having Parent/Teacher Conferences. She also doesn't have school today or Monday! Her class party was crazy! 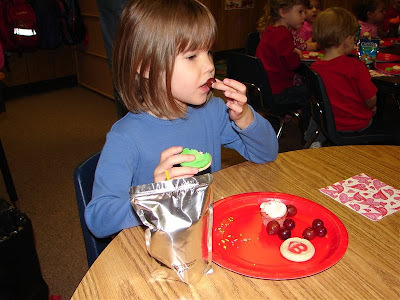 They had pizza, cookies and of course, CANDY! Rachel is kind of hard to see in this picture. You can only see the back of her head and she has on a pink shirt and is behind a boy with a black t-shirt on. Rachel looked away just as I took this picture. 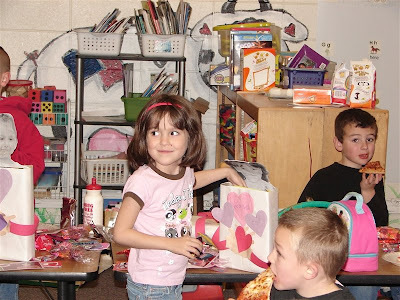 She was so excited to look at all her valentines! You can see the boys in this picture really were enjoying their pizza! 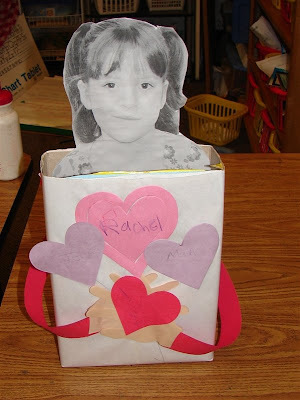 Rachel's class made the CUTEST valentine box. They used cereal boxes and wrapped them for the kids to decorate. I love the picture and it made it easy for the kids to identify whose box it was! Parties are all over and our candy bowl is now full once again. I'm sure it will be empty by the time Easter comes around!! Hope you all have a wonderful Valentines Day and a great weekend. Cute pics! I love the cereal box valentine holders.